This report on the educational achievement of Asian Pacific students in Minnesota, conducted by the Council on Asian Pacific Minnesotans, broadens the data on Asian Pacific students in Minnesota. The Council on Asian Pacific Minnesotans is a state agency that advises the Minnesota state legislature and governor’s office and advocates for the well-being of Asian Pacific Minnesotans. According to the Minnesota Comprehensive Assessment (MCA) 2011 test results, 66.1% and 54.4% of Asian Pacific students scored as proficient on the MCA reading and math tests, respectively. In comparison, 80.8% and 63.3% of White students were proficient in reading and math, respectively. This seemingly smaller achievement gap between Asian Pacific and White students has led to less attention and concern given to the needs of Asian Pacific students in Minnesota. However, researchers, community members, and educational professionals have long recognized that the reporting of aggregated data for Asian Pacific students is misleading and masks educational disparities experienced within the Asian Pacific population in Minnesota. In response, this report disaggregates MCA data for Asian Pacific students by language spoken at home, ethnicity, income level, English proficiency, and mobility. Through such analysis, this report provides new understandings about the academic performance of Asian Pacific students in Minnesota. Significant achievement gaps exist for refugee experienced Asian Pacific students. 50.3% and 40% of refugee experienced Asian Pacific students were proficient in reading and math, respectively. Less than 17% of Burmese students were proficient in reading or math, the lowest of any ethnic or racial student group. Less than 59% and 40% of Lao, Hmong, and Cambodian students were proficient in reading and math, respectively. In comparison, 80.8% and 63.3% of White students scored as proficient in reading and math, respectively. Students’ income level, English proficiency, and mobility status were significant factors in predicting their academic achievement. Low-income Asian Pacific students experienced achievement gaps of up to 31% on the MCAs in comparison to their more affluent Asian Pacific peers. Asian Pacific students receiving English Learner services experienced achievement gaps of up to 44% on the MCAs in comparison to English proficient Asian Pacific students. Homeless or highly mobile Asian Pacific students experienced achievement gaps of up to 23% on the MCAs in comparison to non-mobile Asian Pacific students. The findings from the disaggregated data directly counter the widely held misconception that all Asian Pacific students were performing at levels well above other minority students and only slightly below White students, and thus, were not as deserving of additional support. In reality, refugee experienced, low-income, English learning, and highly mobile Asian Pacific students experience significant educational disparities, and in some cases, had lower proficiency rates than other racial groups. 1. Standardize the practice of collecting and reporting disaggregated student data. Without disaggregated data, the educational disparities of Asian Pacific students will continue to be covered up by misleading information, making it difficult to allocate attention, resources, and support for students who need it most. 2. Streamline efforts that monitor and address the additional challenges faced by refugee experienced students as well as by students who are low-income, English Learners, and/or highly mobile. Refugee experienced and socioeconomically disadvantaged Asian Pacific students experience significant educational barriers. Efforts to overcome these barriers should be evaluated and successful models of educational leadership, pedagogy, and programming should be shared across the state. 3. Increase the cultural competency and awareness among educational professionals of Asian Pacific students. Understanding the strengths, interests, and needs of students is crucial in moving away from a deficit view of diverse student populations and in implementing strategies to increase the academic growth of students. 4. Policy makers and education leaders should solicit the input and involvement of refugee experienced and socioeconomically disadvantaged Asian Pacific communities in the vision of educational equity. Community members should be regarded as powerful partners in education who have expertise in determining the viability and effectiveness of potential educational programming, strategies, and interventions for their students. As a follow up to our Asian Pacific Day at the Capitol, we would like to highlight some of the movement at the capitol on major education legislation and how it affects you and your communities. As you read through these bills, consider contacting your legislator via phone, email, in-person to learn where she or he stands on the issues. Find out who represents you. Recently, the MN Senate passed a bill that will reform Minnesota’s strict seniority-based “Last In, First Out” (LIFO) standard for teachers layoffs. If passed, the bill would authorize schools to base layoff decisions on effectiveness of teachers, letting them keep quality teachers in the classroom. It currently awaits action in a joint House/Senate conference committee. While there is partial support from both sides of the aisle on the bill, concerns about how to determine the “effectiveness” of a teacher have held up the bill. Currently, a teacher evaluation system is in the works in Minnesota. In thinking about this bill, a question raised is, “Why are we laying off teachers?” A good direction to look is the fiscal health of schools and the impact of reduced educational funding. During last year’s shutdown, the MN legislature and Gov. Dayton emerged with a budget shift that, in simple terms, borrowed from schools by only paying 60% of their funding this year and scheduling the rest of the payment for next year. Due to this shift, many districts have reduced budgets, relied on short term loans that incurred additional financial costs, and/or cut faculty and staffing levels which increases class sizes. Below this section is an infographic that briefly covers many aspects of the issue. Additional details are being tracked at Parents United’s website. Along with the rest of the nation, Minnesota’s financial forecast has improved and state leaders have agreed that the school shift needs to be paid back, starting with a 70%/30% payment (10% improvement). The GOP have proposed a plan to pay back the shift using the state’s emergency reserves. The DFL, Gov. Dayton, and Minnesota Management and Budget commissioner Jim Schowalter have stated that using the state’s budget reserves is financially risky. The DFL pitched a plan (HF 2480/SF 2029) to repay the shift by ending tax loopholes for foreign businesses in Minnesota. The GOP has criticized the plan as unfriendly to business in Minnesota. At this time, the GOP-led plan has passed in the House and awaits action in the Senate. Expanding college access and earning dual credit in high-school have been popular topics in Minnesota and on the federal level. Currently, bills in both house and senate have proposed expanding Post-Secondary Enrollment Options (PSEO) to allow student to get dual-credit (high school and college credit). The bills have bipartisan support; however, concerns have been raised about the senate version, which allows public dollars to be spent towards for-profit, private colleges (non-profit, private colleges are eligible under current law). A puzzling dilemma arose last session when the MN legislature voted to end integration revenue while still keeping the state’s desegregation rule in place. The contradictory decision led to the creation of the Integration Revenue Replacement Task Force to determine how to restructure integration revenue funds for 2014 and beyond. The task force’s recommendations were released in February and recently emerged as a bill in March. All district plans must be locally developed and establish clear student achievement goals that address racial disparities, as well as other measureable goals to which they will be held accountable and report to their respective communities. While action is not expected to take place in 2012, action must be finalized by 2013’s session. The Council encourages community discussion with your legislators and school leadership on the topic of racial disparities in education. Still waiting for… (the wish list for the Council). While there is no movement on H.F. 2840, we expect another bill and a more motivated legislature to act on the integration revenue issue next year in 2013. We’re hoping for bills next year that will address diversity in Minnesota’s teacher workforce. Either bills that will increase the number of teachers of diverse backgrounds or help retain and support diverse teachers already in the workforce. In the meantime, the Council is also working directly with the MN Department of Education to help create more communication with Asian Pacific communities, to create and adopt a statewide public agenda for closing the achievement gap, and to help engage families in their child’s education. Need more information on the topics here? Contact capm@state.mn.us or call Brian at 651-757-1742. Need to know who your legislators are? Find out who represents you. What to get more involved? Just get in touch with Brian Kao, the Council’s lead staff on education. The Council on Asian Pacific Minnesotans, created in 1985, is a state agency that advises the Minnesota state legislature and governor’s office on issues pertaining to the Asian Pacific community. Hawkins, Beth. 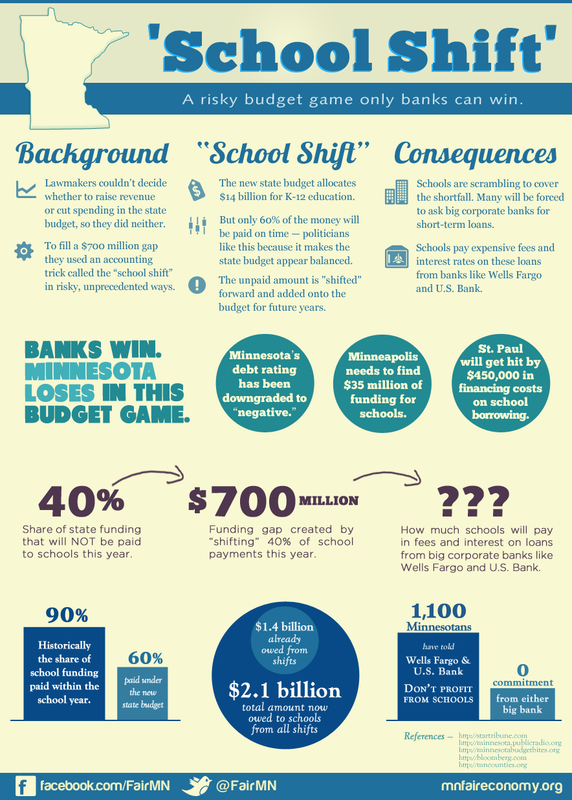 “Shifts 101: What new proposals would mean for Minnesota’s schools | MinnPost.” MinnPost. Web. 23 Mar. 2012. <http://www.minnpost.com/learning-curve/2011/07/shifts-101-what-new-proposals-would-mean-minnesotas-schools&gt;. “Minnesota school districts begged; now they borrow | StarTribune.com.” StarTribune.com: Web. 23 Mar. 2012. <http://www.startribune.com/local/west/134799543.html&gt;. “GOP, Dayton Differ Over Plan To Repay Schools « CBS Minnesota.” CBS Minnesota. Web. 23 Mar. 2012. <http://minnesota.cbslocal.com/2012/03/08/gop-dayton-differ-over-plan-to-repay-schools/&gt;. 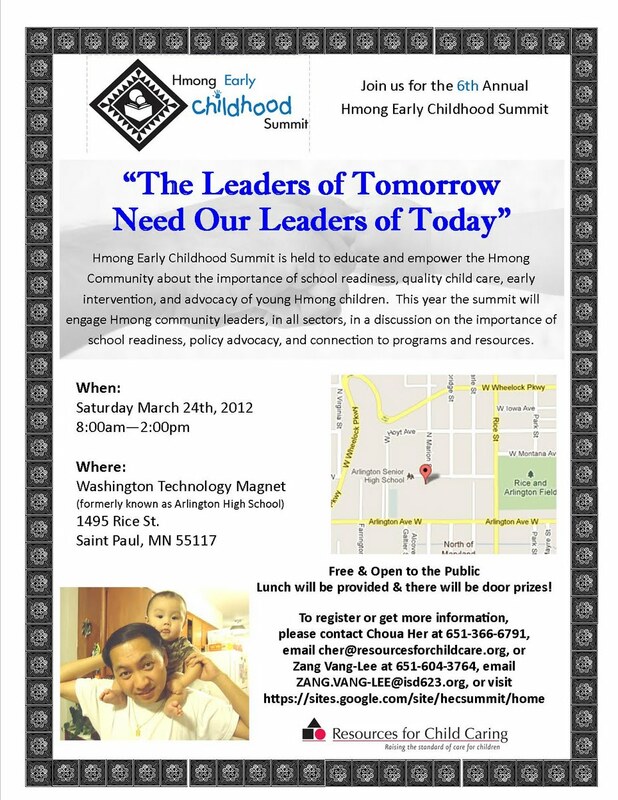 On Saturday March 24th, 2012, Hmong Early Childhood Summit will hold its 6th annual summit at Washington Technology Magnet School in Saint Paul (formerly known as Arlington High School). This year the summit will engage Hmong community leaders, in all sectors, in a discussion on the importance of school readiness, policy advocacy, and connection to programs and resources. Our goal is to inspire Hmong community leaders to develop innovative ways to promote and support early childhood education at home, in daycare programs, churches and organizations, etc. and engage in policy advocacy. Free and Open to the Public. Pre-registration is Required. Lunch will be provided and there will be door prizes. Between now and March 19th, we’ll be posting stories for you to read and to discuss on our facebook site. Read the stories from Asian Pacific students on why it’s so important to support our students academically, emotionally, and as a community. On a cold December day in 2009, 15-year-old Trang Dang was walking home from school with her sister and eight friends, all recent Vietnamese immigrants.Dang, who is 5’9” with a medium build and a dimpled, contagious smile, asked the principal to accompany them because she and the others were terrified by the intense bullying and violence against Asian students that had taken place earlier that day at their school. Midway through the walk, the principal, LaGreta Brown, disappeared. They debated whether to stay or continue walking… they opted to try to make it home that day on their own. That horrible day at South Philly High was no isolated incident. Ly, a junior at South Philly, said that ethnic tensions had long been circulating. The school “remained indifferent for years to allow the tensions to escalate to that day,” Ly said, accusing it of refusing to address the root causes of the harassment and violence that the students regularly endured. 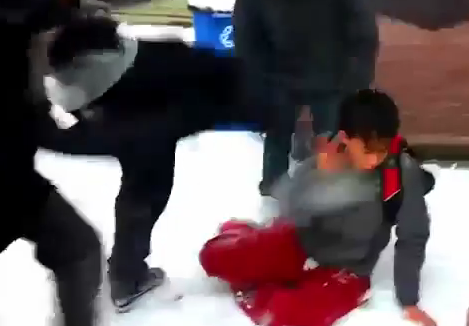 There aren’t many places for Asian youth to turn when bullying occurs. William Ming Liu, a psychologist and professor at the University of Iowa, explained that Asian bullying victims often feel they can’t turn to their parents because their parents don’t understand what bullying is. Recent research suggests that young Asian Americans are facing a bullying epidemic. Last year, the U.S. Departments of Justice and Education released a joint study showing that over half of Asian American teens said they’d been the subject of targeted abuse at school, versus around a third of blacks, Hispanics and whites. Bullying includes verbal taunting, physical assaults, exclusion from a peer group, spreading rumors and cyber bullying. This year at the MN state capitol, law makers and state leaders are taking on bullying as a priority issue. Your voices and stories are needed to help ensure that bullying is addressed for all students! The harm done by the model minority myth. In a study conducted by the Coalition for Asian American Children and Families, Asian Pacific Islander (API) students spoke about the treatment from non-API peers and teachers that presumed that Asian Pacific students were all academically talented and did not deserve any extra help. Has the model minority myth ever made things harder for you in school? Did it mean trying to live up to an unreasonable standard? Students, what is life like as an Asian Pacific student? Share your thoughts on our facebook event site. Gov. Mark Dayton’s office today announced the members of a Governor’s Task Force on the Prevention of School Bullying. Two Republican legislators have been invited and are yet to be announced by leadership. 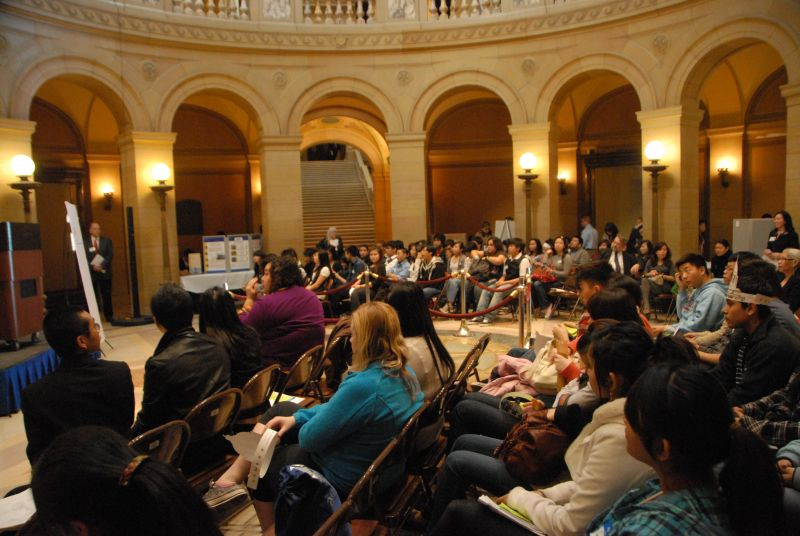 On March 19th, 2012, the Council on Asian Pacific Minnesotans (Council) will hold the 2012 Asian Pacific Day at the Capitol with the central theme of “Educational Success for Every Student.” The day’s event will start with an advocacy training at 10 am, followed by a public rally in the state capitol rotunda at 11:45 am. Attendees will then visit state legislators to share their stories, concerns, and experiences relating to education. Several organizations have already signed on as sponsors and confirmed speakers at the rally include MN Department of Education Assistant Commissioner Rose Chu and Senator John Harrington. The annual Day at the Capitol is held as a way to help deliver concerns from community members directly to state legislators. Attendees will receive advocacy training from Organizing Apprenticeship Project trainers, receive a briefing on educational issues, hear from community and public leaders, and speak with their own legislators. The Council hopes to use the Day at the Capitol to shine a light on the educational achievement gap among Asian Pacific students. Brian Kao, research analyst for the Council, explains: “Often times, discussions about the educational achievement gap tend to leave out Asian Pacific students; we’re still looked at like the model minority. In reality, the statistics for Asian Pacific students is very misleading and hides the fact that students from many Asian communities are in need of additional support and resources. It’s up to us to show our state leaders what the research says and to tell the stories that reflect our educational realities.” Coinciding with Day at the Capitol, the Council will be releasing their 2012 Education Report on Asian Pacific Students in Minnesota, which will contain educational data for Hmong, Chinese, South Asian, Vietnamese, Lao, Cambodian, and Burmese students. The Council encourages people to register early for 2012 Asian Pacific Day at the Capitol. Registration is free and open to the public and can be completed at http://2012apdatc.eventbrite.com/. Questions can be directed to Brian Kao at brian.kao@state.mn.us or at (651) 757-1742.